Hedy is not having her best day, but at least the incident is over, and the next scene will be much cosier. I have some news! There will be two weeks in November when I won’t be able to post pages. This is because I’m going to fulfill one of my lifelong dreams: I’m going to visit Japan, a country which has inspired my art in so many ways. These two Thursdays with no update will be the 9th an 16th of November. 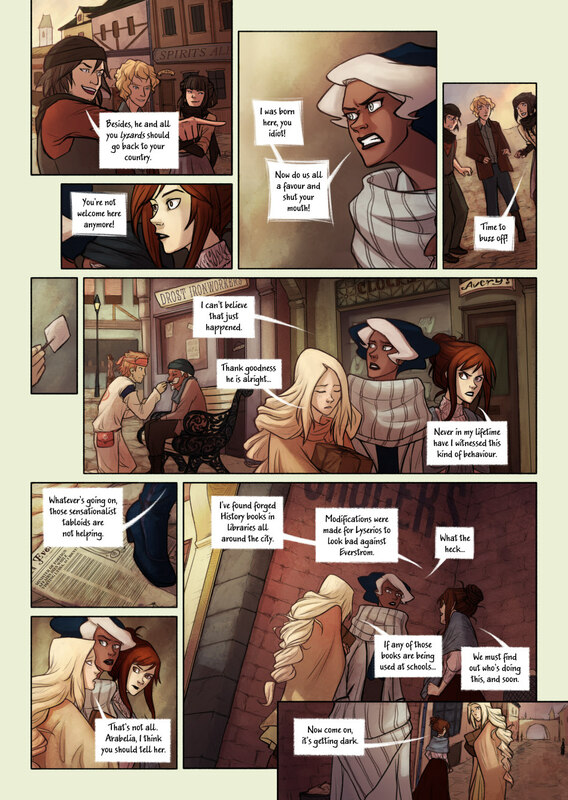 The week after that is both Thanksgiving Day on Thursday (23rd) AND Bookwyrms’ second year anniversary on Sunday (26th)! Sooo I’ll probably publish the page on Sunday instead. I’ll keep you posted anyway! Finally, I have started to get quotes and plans to get the first volume of Bookwyrms printed! It’s all still a bit daunting and I’m definitely going to need a Kickstarter/preorder campaign in order to print them, but I think it’s doable! And I cannot wait to see these printed at some point next year. Yay! I’m so excited for you! Japan is supposed to be amazing and beautiful! The culture and art there is so different and it is fascinating. I have never been, but a friend of mine went last summer with her family and said it was spectacular. AND Bookwyrms printing is also so exciting! It’s tough work just making an online comic, and you should be so proud of yourself! Are you planning to try to put it into any stores in you area? I’m sure that town bookstores would be willing to put them in their stores, and it would get you a bigger audience. Anyway, I’m so excited! Thank you for being excited for me! ^^ I really can wait to visit Japan, it’s as you say: such a fascinating culture and art! It’s really very rewarding just to see that I’ve made 140 pages already of this story, yes… Regarding stores, it crossed my mind! Depending on the number of books I manage to print I’d like to bring some to local bookshops or comic shops. I’d also like to leave a copy at my local library ♥ Thank you for giving me ideas to spread the word about Bookwyrms! Thank you! ^^ I’ve been trying to learn some Hiragana lately, I’d love to speak Japanese so badly! But ah, time is never enough. It’s been ages since I learnt hiragana. ^_^ I remember that I made my own flashcards to practice with, which I think was about enough. When I started learning kanji I bought a small whiteboard that I could just practice my writing on and then erase it. I also bought some kanji flashcards, and they came with a card which had all the hiragana on one side and the katakana on the other which I could just carry around in my wallet. Discriminating book forgers… Also: discriminating people on the street. Who is doing such a secret campaign….. :-/ Creepy!!! Maybe the times you can keep yourself and your friends out of things are coming to a close, Hedy! Aaaaah have so much fun in Japan!! I hear it’s amazing! And I;m so excited for a Bookwyrms Kickstarter! too! Just stumbled upon this webcomic, and it is cool!! Love it. Thank you so much, Alice! That’s so kind of you 😀 Our plan is is to focus on central/south Japan this time, but hopefully next time we can go up north to Hokkaido even! (Yes, already thinking I’ll need a second visit at some point in my life, haha!) Thanks a lot, though! As of 14-Jan-18 the TWC link isn’t working. In addition, this has been true of a number of other comics. BTY I do like your comic, the supernatural element didn’t really surprise me, the comic has always had that sort of atmosphere, at least IMHO. I’m glad you feel that way regarding the supernatural element! Also thank you for letting me know about the link. I tried it now and it’s working for me, so maybe it didn’t work for a period of time? Not sure what happened there! Indeed! They really have to do something! As the intensity of the story increases, I find it harder to read it leisurely as I want to race through it. So I force myself to slow down and continue to drink in your love artwork.